Although I was never inside the old Walker House on Front Street, I remember it quite well. in the 1950s, when I first received a driving license, I passed by it many times while driving south on University Avenue, en route to the newly constructed Gardiner Expressway. In that decade, the Walker House was highly popular as it contained several well-known restaurants – Rathskeller, the Franz Josef Room, and on the west side of the hotel, the Swiss Bear. The latter was in a building that resembled a Swiss chalet. On weekdays, these restaurants were frequented by businessmen, as the hotel was not far from the financial district. I had only one personal contact with the hotel, and it was merely with an artefact from it. After the hotel was demolished, its wooden bar was sold, removed, and installed in Crispins Restaurant at Church and Gerrard Street East, in a bar at the rear of the eatery. I remember being shown the bar. It was about 30 feet long, built of dark-stained wood. It possessed a rich mahogany-like sheen, but it was likely crafted from native wood such as oak or cherry. It would have been impressive in its original location. The Walker House was completed in 1873, the same year that the Grand Trunk Railway opened its station on the Esplanade, between York and Simcoe Streets. The Esplanade was constructed on landfill, created by dumping soil and rubble into the harbour south of Front Street. The Walker House was a short distance to the northeast of the station, constructed to accommodate travellers that arrived in the city by train. In 1873, the hotel advertised that guests would be met at the station and their luggage transported directly to the hotel’s lobby. In 1879, the hostelry hosted guests that arrived to attend Toronto’s first permanent Industrial Exhibition, a precursor of today’s Canadian National Exhibition (CNE). The Walker House was also constructed on landfill, the slope of York Street on its east side, indicating the lake’s original shoreline. However, even when the hotel was erected, the lake had already been pushed further south. On the hotel’s west side there was an alley, and next to it was the Cyclorama. The hotel was well known for having comfortable rooms during the summer months, as it received the cool breezes from the harbour. The four-story Walker House was rectangular in shape, its northeast corner angled so that its entrance faced both Front and York Streets. In 1892, the doorway was relocated to the north side, at 121 Front Street East. The rooms contained numerous large rectangular windows that provided excellent interior lighting and a view of the harbour. The top of the windows were Roman arches, typical of many 19th-century buildings. The windows and their surrounds provided texture on the otherwise unornamented brick facades, the cornice at the roofline also unadorned. The simple rectangular shape of the building allowed corridors on the floors to be straight, with exit stairways at each end. This lessened the possibility of guests being trapped, if a fire occurred. When the hotel opened in 1873, the proprietor was David Walker, who had worked for many years at the Americana Hotel at Yonge and Front Streets. Originally, the Walker House contained 125 rooms, which rented for $2 a day. The hotel was enlarged several times, and eventually a fifth storey added. The establishment was immensely popular, since not only was it near the train station, it was close to the luxury shops on King Street, and the provincial legislative buildings at Front and Simcoe Streets. The hotel was renown in the latter part of the 19th century for its fine dining room, which seated 170 people. Its New Year’s Eve banquets and Christmas-day dinners were always booked well in advance. The Walker House competed for patrons with the prestigious Queen’s Hotel, further east on the north side of Front Street, where the Royal York is today located, and the Rossin House at King and York. The Walker House was one of the first hostelries to install an elevator and electric call buttons to allow guests to connect with the front office. However, during the 1970s, the land near the financial district was among the most coveted real estate in Toronto. Sites were continually being sought by developers to erect low-rise and mid-rise structures. The Walker House became was a casualty of this building boom. It was sold and demolished in 1976, another Toronto landmark from my youth disappearing. A 19-storey office tower was erected on the site – Citigroup Place – completed in 1983. Location of the Walker House at Front and York Streets. The site is today a considerable distance from the lake. Menu of the Walker House on January 2, 1888. In the sketch, the hotel has only four storeys. From the collection of the Toronto Public Library. Watercolour of 1890, which depicts the Walker House on the right-hand side. The building on the left is the proposed CPR Railway Station, which was never built. The Union Station of today was eventually erected on the site. In the watercolour, the shoreline of the lake is not far from the hotel. The trains on the tracks south of the Esplanade are visible in the far background. Collection of the Toronto Public Library, r-2417. Map of 1910 showing the Walker House on the southwest corner of Front and York Streets. The Union Station in the lower left-hand side of the map is not the train station of today, but the one that opened in 1873. The year the map was published, a grand entrance had been added to it on its north side, on Front Street. The round structure on the west side of the Walker House is the Cyclorama. There is no University Avenue on the map, as it was not extended south of Queen Street until the 1930s. Map from the Goad’s Atlas of 1910, Toronto Reference Library. Postcard depicting the Walker House in 1910, after the fifth storey was added. Toronto Public Library, r-2214. View gazing west on Front Street from Bay Street in 1924. The new Union Station of today was not yet open to the public. It officially opened in 1927. The Queen’s Hotel is the white building in the upper right-hand corner of the photo. The Walker House is to the west of Union Station, at York at Front Streets. Toronto Public Library, r- 4357. Gazing west on Front Street from near Yonge Street in 1928. Union Station is now open, but only partially functioning. The Royal York has replaced the Queen’s Hotel, but is not yet open for guests. The Walker House is visible in the distance on the west side of the new Union Station. The tower behind the Walker House is part of the old train station of 1873, the section with the tower on Front Street erected in 1910. Toronto Archives, F1244, Item 10085. The Walker House in 1945. The view gazes directly at the northeast corner of the rectangular-shaped building. York Street is on the east side of the hotel. The building to the south of the hotel, on its south side, is on Station Street. It remains today and is included in the Skywalk that connects the new Union Station (1927) with the CN Tower. Toronto Archives, F1247, S 1057, Item 054. Undated photo of the Walker House. Next to the hotel (west side) is the round facade of the Cyclorama, which was also demolished in 1976. Between the hotel and the Cyclorama is the pointed roof of the Swiss Bear Restaurant. View gazes west on Front Street from York Street. The slope on York Street is where the original shoreline was located, prior to landfill being dumped into the harbour. Toronto Archives, F0124, Fl 0003, Id. 0056. The 19-storey Citigroup Place at Front and York Streets in 2016, where the Walker House once stood. The Citigroup Place tower, and visible to the south of it, the building from the old Union Station, now part of the Skywalk. The publication entitled, “Toronto’s Theatres and the Golden Age of the Silver Screen,” was written by the author of this blog. It explores 50 of Toronto’s old theatres and contains over 80 archival photographs of the facades, marquees and interiors of the theatres. It relates anecdotes and stories by the author and others who experienced these grand old movie houses. Another book, published by Dundurn Press, containing 80 of Toronto’s former movie theatres will be released in June, 2016. 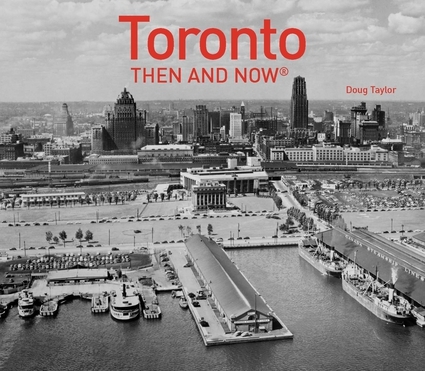 It is entitled, “Toronto’s Movie Theatres of Yesteryear—Brought Back to Thrill You Again.” It contains over 125 archival photographs and relates interesting anecdotes about these grand old theatres and their fascinating history.